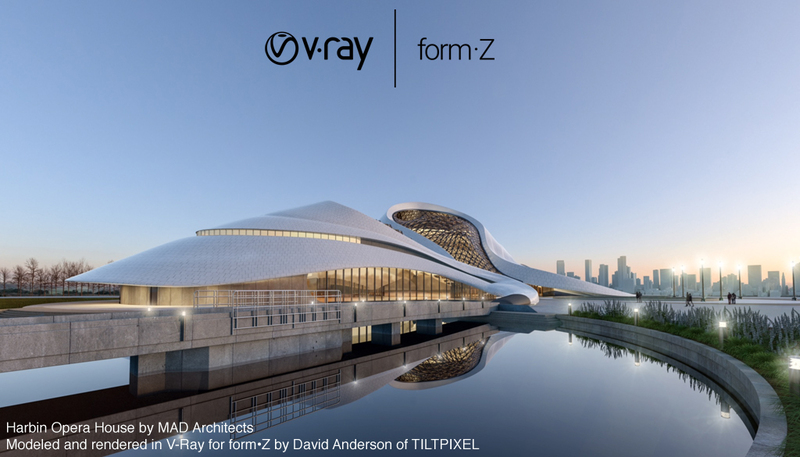 V-Ray for form·Z is Here! The power of Academy Award winning V-Ray rendering is now available for form•Z. We have integrated V-Ray seamlessly into form•Z so that you will find your way around very quickly and get instant high quality renderings “out of the box”.For more information Click Here. formZ PRO v8.6 ( free download for all current v8.5.7 users available ) upgrades from all previous versions are available here ONLINE UPGRADES. or formZ Jr ( latest version ) The formZ integrated interface allows the easiest set up for high quality rendering ever, with a guide for a great initial result set up automatically. V-Ray v3.6 implementation Yet below the ‘hood’ is a great range of new options that are part of the new V-Ray v3.6 capability available on other major 3D modellers. You can even open their V-Ray scenes (vrscene files ) or export your scene to be opened in their V-Ray. Harbin Opera House – MAD architects modelled and rendered in formZ Some of best 3D modellers use V-Ray for its quality of rendering and rendering speed. V-Ray for formZ now supports all modern CPU, GPU* or Hybrid ( both CPU& GPU ) on either MacOSX ( 10.9.5 and above ) or Windows 7, 8.0/1 and Windows 10 Use it for Architecture rendering, Interiors, Point of Sale mock ups, Trade show stands or Product design. It now renders carpets, fabrics, fur and grass. Straight away the rendering is much faster than with RenderZone but it can be accelerated now with the option of using GPU – nVidia CUDA based technology – huge improvements are possible! Powerful hybrid rendering – You can render on nVidia CUD GPUs – or a combination of both. Material Library – over 550 realistic physical based materials, such as glass, coated plastics or metals,wood, stone etc. Cutaways and Clipper – Render sections and cutaways with ease using the V-Ray Clipper. Powerful light calculations – V-Ray Adaptive Lights algorithm will speed renders up to 7 times faster on some scenes. 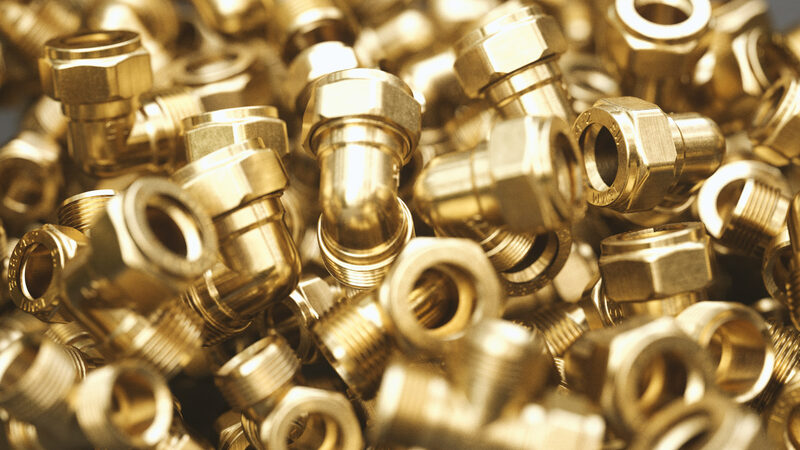 The power of Academy Award winning V-Ray rendering is now available for formZ. We have integrated V-Ray seamlessly into formZ so that you will find your way around very quickly and get instant high quality renderings “out of the box”. GPU rendering requires nVidia – CUDA based video cards with over 2GB RAM, but it is recommended at least 8GB RAM. Announcing V-Ray for form•Z beta release. Brand new fully integrated CPU and GPU rendering for the form•Z community. The power of Academy Award winning V-Ray rendering is now available for form•Z. We have integrated V-Ray seamlessly into form•Z so that you will find your way around very quickly and get instant high quality renderings “out of the box”. Come and try rendering with this exciting new product. 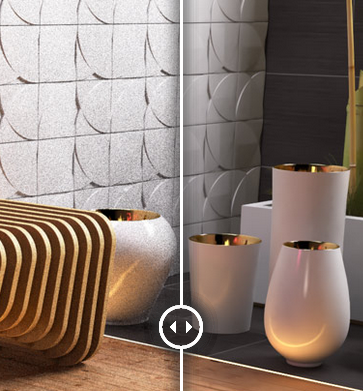 Denoiser – With V-Ray’s new denoising technology, you can automatically eliminate noise and cut render times by up to 50%! Click here for an overview video of the V-Ray for form•Z interface. V-Ray for form•Z Beta is open to all form•Z 8.5 pro users. Don’t wait, Click here to register for the beta. Not using form•Z 8.5 pro yet? upgrade now! Want to see V-Ray 3.6 for form•Z in action? Join us on November 14, 2017 at 12:00 EST (4am – Sydney/Melb/Canberra ESST) for a special webinar to learn about what V-Ray for form•Z is all about. Click here to register. We welcome any and all feedback. Come join the conversation and share your though on our forums. For any questions you may have, please contact us via email at sales@smarttec.com.au or call us at 02 99394000. The current private beta release of Vray v3.6 is getting ready for a Public Beta release after some awesome results and examples from formZ users. We are hoping to have a releasable public version in a few weeks. Are you ready? We are and we believe we have what will be the next most valuable tool in your digital toolbox! 1. V-Ray for formZ is running on both WIN and OSX. 2. We are requiring that you have the latest version of formZ 8.5. 3. 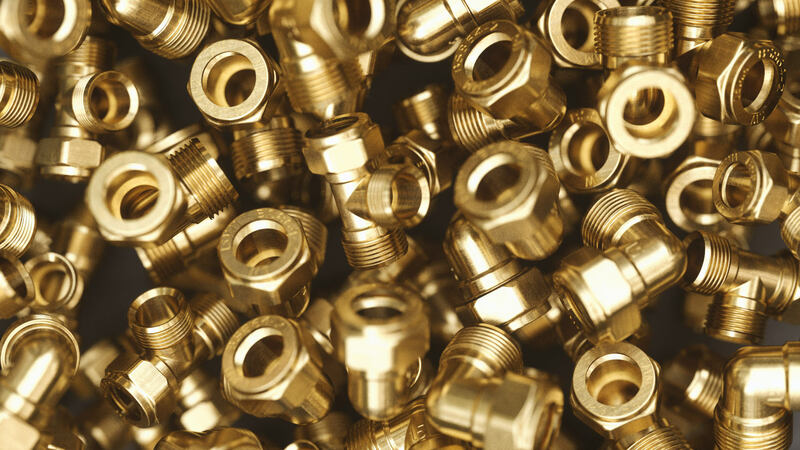 V-Ray for the most part will need the same machine specifications as you need for formZ itself. If you have more CPU power and RAM that’s fine too. If you have a ‘Cuda’ based GPU cards then bring it on! 4. We are going to be looking for images and projects to share as part of our marketing efforts. What ever you can share with us we’d appreciate it. 5. This is Beta software. Although we recognize it as a stable release please use caution when using the plugin. Work on files that you know you have backed up or that you will not risk your livelihood on. If you’re interested please drop us an email at vray@formz.com with examples of your best rendering work. If you can give us an idea of the amount of time you think you can dedicate to testing on a weekly basis that would be helpful too. Watch this space for latest updates. The Maxwell Render 4.1 release is a big one. If you haven’t updated to Maxwell 4 yet, now is the time. If you’re new to Maxwell and want to kick the tyres first, download a trial copy. Please come back here and we can help with your new version. Please note: The following is oriented to the formZ implementation. There’s now an integrated denoiser. When enabled, there will be NO noise in your final rendering. This means Maxwell-quality renderings in a fraction of the time it took previously – in either CPU Production or GPU mode. Expect 2x – 8x faster architectural visualizations. 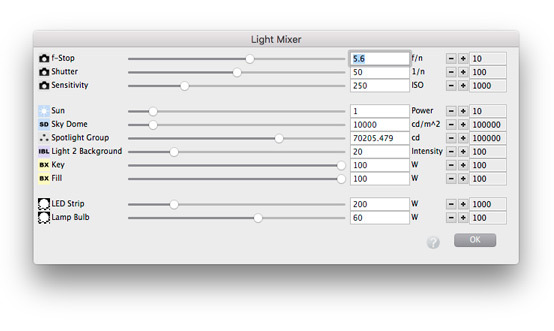 Next up, we have a new Light Mixer. When used in conjunction with Fire, you can interactively fine-tune the contribution of all lights and emitter materials in your scene from one convenient panel. It’s a lot like Multilight, inside formZ.